Yet, Trump has been convinced by his advisers to intervene on behalf of Guaido, a socialist “alternative” to Maduro who has pledged amnesty for virtually all officials of the Maduro regime, including its most corrupt bureaucrats and military officials. Andres Oppenheimer, a columnist for The Miami Herald and El Nuevo Herald, says the leaders of the opposition in Venezuela see 35-year-old Juan Guaido “as an accidental and temporary president, who only seeks to preside over a rapid transition to democracy.” An industrial engineer, Guaido appears to be sincere and well-motivated but rather naïve in his approach to the communist butchers running his country. His offer of amnesty to Maduro and top military officials would undermine the survival of the democracy he says he is trying to achieve. What’s more, if snap elections are held, as a result of the demonstrations and international pressure now taking place, the socialist and communist parties would have the edge. Fox Business added, “President Trump Opens a New Window. 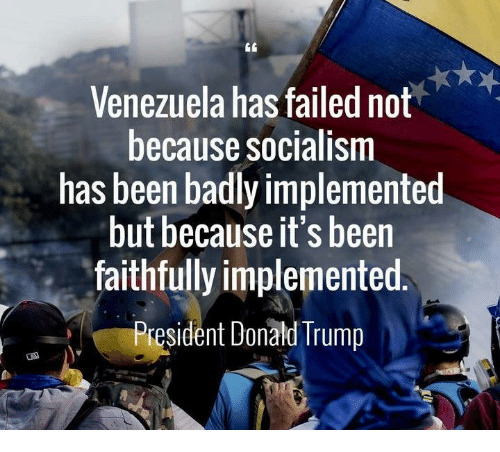 has vowed to use the ‘full weight’ of America’s power to help the poverty-stricken country go from a socialist state to a genuinely democratic Venezuela.” This may be the goal of Trump, who later spoke to Guaido over the phone, but the members of the Socialist International orchestrating this regime change do not want to see the end of a socialist state in Venezuela. Their goal is to make Venezuela into another kind of socialist state – similar to what Rep. Alexandria Ocasio-Cortez of the Democratic Socialists of America is proposing for America. Indeed, the DSA was once an affiliate of the Socialist International. Don’t be surprised if Stiglitz surfaces as an adviser to a new government in Venezuela that promises a kinder, gentler form of socialism. Of course, it will require a heavy dose of American foreign aid, even some form of global taxes, to generate the revenue to make it work, all under the watchful supervision of the United Nations. Let’s hope President Trump doesn’t fall for the scam. The people of Venezuela deserve freedom and free enterprise, not a new version of socialism that lends itself eventually to another complete communist takeover of Venezuela.